URGENT CAMPAIGN: PEOPLE, RISE UP! Let’s STOP 24 hour construction and CUT the whole budget, TOGETHER! Let’s REVOKE the naval base project! The struggle to stop 24 hour construction and cut the whole 2013 budget of 200.9 billion won on the Jeju naval base project is not only held in front of the construction gates in the village but in the center of Seoul as well. Some people who joined the Great March for Life and Peace: Let’s live together! All are the SKY! 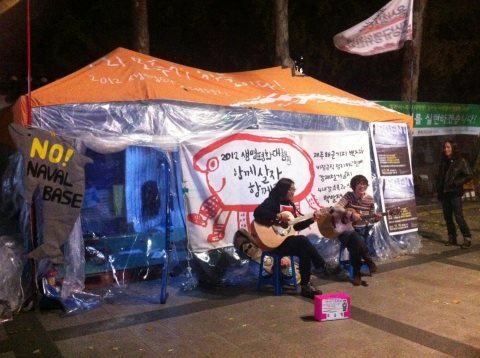 (Oct 4 to Nov. 3) remained in Seoul and set up a sit-in tent across the City Hall to promote the campaign to cut all the budgets on the naval base project, 2013. The tent is also an expression of solidarity with the laid-off workers of Ssangyong Automobile Co. Mr. Kim Jung-Woo, leader of Ssangyong workers met his 31st day protest fast as of Nov. 9, 2012. Village mayor Kang Dong-Kyun, committed to widen and deepen the struggle through solidarity to revoke the Jeju naval base project and change the Government through December Presidential election became Mr. Kim’s strongest ally, as well as one of the symbols of people who are oppressed by the current government in the same vein of Capitalism, developmentalism and militarism. On Nov. 9, Great news was told to the participants of the great march and people in the Gangjeong village. 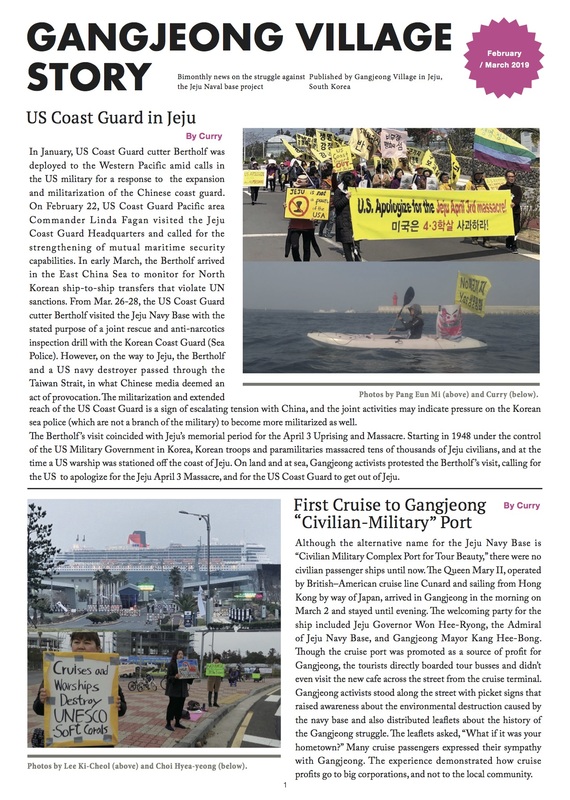 All the workers of the Hanjin Heavy Industry, Busan, who have struggled for years were all reinstated (Kim Jin-Suk is probably the most known symbol of the struggle). The march participants have visited the workers on Oct. 17, which happened to be the commemorating period (Oct. 17 to 31) on the two martyr workers, Kim Joo-Ik, Gwak Jae-Yol, 9 years ago. Dungree’s video reminds the event of Oct. 17 and emphasizes the importance of the solidarity among the oppressed. 2. 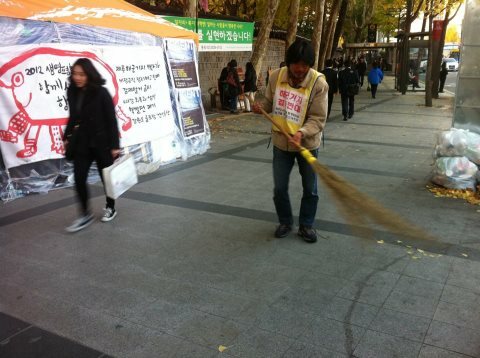 The law voice from the struggle field: Please come to Gangjeong! Let’s stop 24 hour constriuction and cut the whole budget, TOGETHER! Here is a video made by a young female peacekeeper, Mooming, herself who has daily struggled in the field to stop the 24 hour construction vehicles without enough sleep but with unlimited optimism and humor. 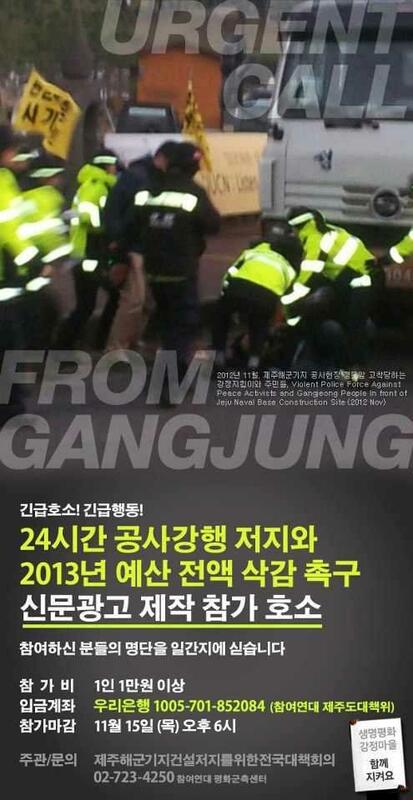 Her video details the human rights violation by the police, people’s joyful creation of events in spare time and emphasizes the urgency of people’s unity, by coming to Gangjeong. The police’s consciousness on human rights is near to zero. (# In the early morning of Nov. 10, a female peacekeeper informs that policemen grabbed a woman’s legs widened openduring the process of removing protesters from the protest sites so that the woman cannot but feel insulted and have a feeling of shame. However, the peacekeepers know how to spend their spare time building joyful and creative community between the struggles. The youngsters love computer game while some young artists sing together with guitar, draw painting on the fence and make necklaces for funding resource. A movie director prepares a set to record nearby. Night time snack is another joy~! No Construction (destruction) but yes, night time snack!